Certificate in Anglican Studies - for persons who have previous ministerial education in other Christian denominations. Finally, BKSM is pleased to partner with the ELCA Central States Synod to offer seven approved courses that contribute to the educational requirements for the Parish Ministry Associate program. Students enrolled in a certificate program leading to ordained ministry typically take 10 courses a year, from August to May. 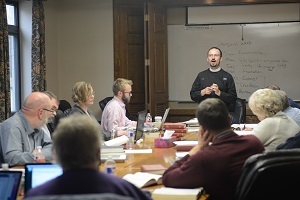 Students on the priest track (presbyteral studies) take 30 classes over three years, while students on the deacon track (diaconal studies) take 20 classes over two years. 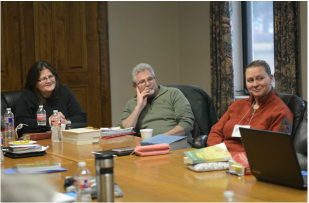 Students seeking a Lay Catechist or Lay Preacher certificate will typically take six courses over one academic year, while the Pastoral Leader certificate requires 10 courses. While most students complete their studies in the proscribed window, it may be necessary for some students to extend this time frame due to career and family conflicts. We encourage all students to work closely with the BKSM dean and their bishop to discuss their education plan. Lay persons are encouraged to enroll in any of our classes for personal enrichment or continuing education. We gladly welcome people from other Christian denominations. However, if you have general questions, feel free to contact us at BKSM. We would love to hear from you.